A few weeks ago, I attended a volunteer meeting for my sorority. These meetings are always a lot of fun as we get to catch up over a delicious meal, talk sorority business and keep up with the latest happenings in each others’ lives. I’ve been a part of this group for a few years now, and I have gotten some of my favorite recipes through these talented women. 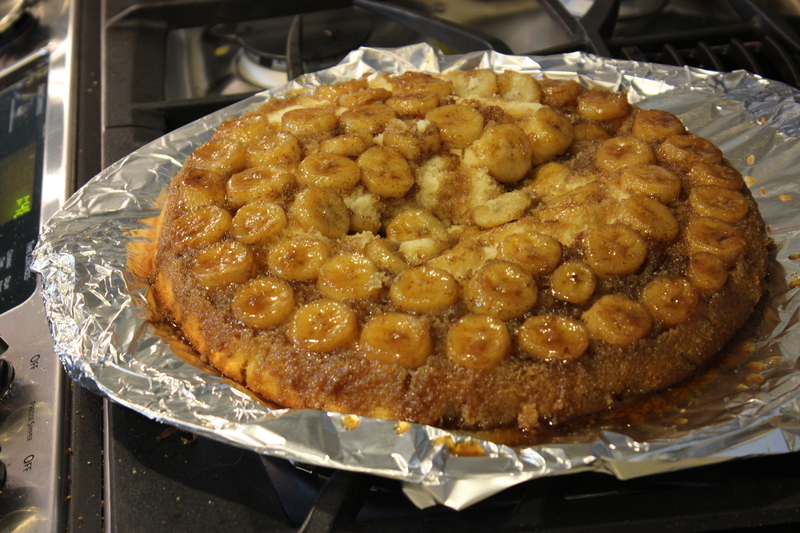 Meet the “Upside-Down Bananas Foster Cake” from Anne Byrn. Holy moly, this cake is delicious! A crispy buttery, brown sugar and banana topping is absolutely heavenly against a butter cake base. It’s rich, but not too rich and doesn’t take very long to prepare. I have not purchased this cookbook yet, but I have it on my birthday wish list and hope it makes its way to my house next month! 🙂 It was fun to make and I had a few laughs on the way, like when I underestimated the weight of the skillet and dipped part of it into the finished product…whoops! Well, it was only a small cosmetic problem and it didn’t mess up the taste at all. You don’t have to LOVE bananas to enjoy this dish. The banana taste is obviously there, but it isn’t overwhelming. Happy baking! 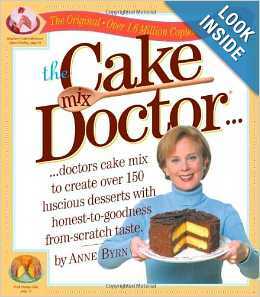 The original recipe is from The Cake Mix Doctor by Anne Byrn. IDOPT used this LiveJournal website for the ingredients and directions and made some adjustments. 1. Preheat the oven to 350 degrees F and place a rack in the center of the oven. 2. Prepare the topping. Place the butter in the cast iron skillet and heat it on the skillet over a low heat to melt the butter. 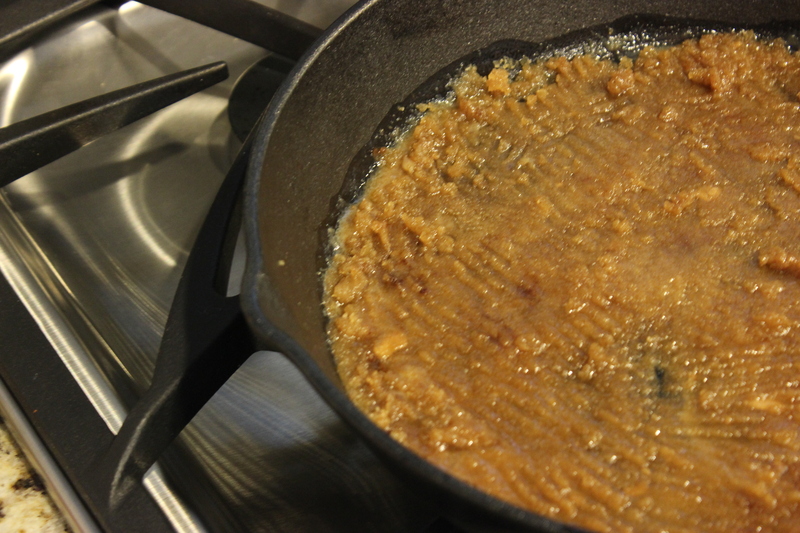 Remove the skillet from the heat once the butter is completely melted. Wit a fork, stir in the brown sugar, spice and rum. 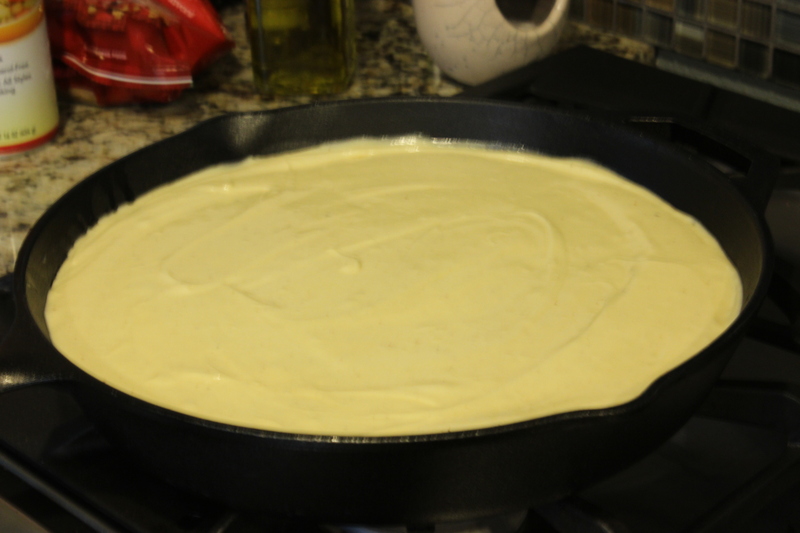 Once combined, use the form to spread the mixture out evenly in the bottom of the skillet. 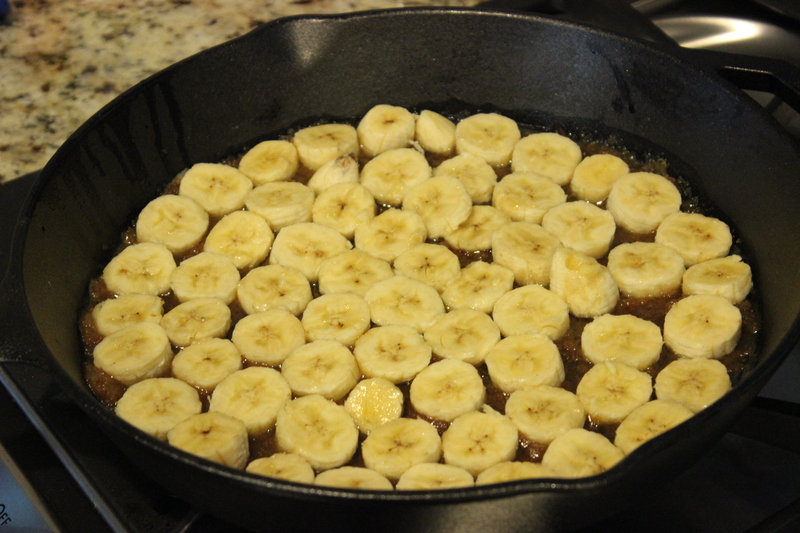 Arrange the banana slices over the bottom of the skillet so they cover the mixture evenly and well. 3. Place the cake mix, melted butter, milk, eggs, spice, and citrus juice in a large mixing bowl. Blend with an electric mixer on a low speed setting for 1 minute. Stop the machine and scrape down the sides of the bowl with a rubber spatula. On medium speed, beat for another 2 minutes and then scrape the sides of the bowl again. The batter should be smooth and creamy. Pour the cake batter on top of the bananas and sugar mixture in the skillet, smoothing it out with the rubber spatula. Place the skillet in the oven. 4. Bake the cake until it rises in the skillet and springs back when lightly pressed with your finger, usually 43-47 minutes. Remove the skillet from the oven and run a long sharp knife around the edge. Carefully invert the skillet onto a heatproof serving plate. (IDOPT used a metal pizza pan and covered it in foil.) 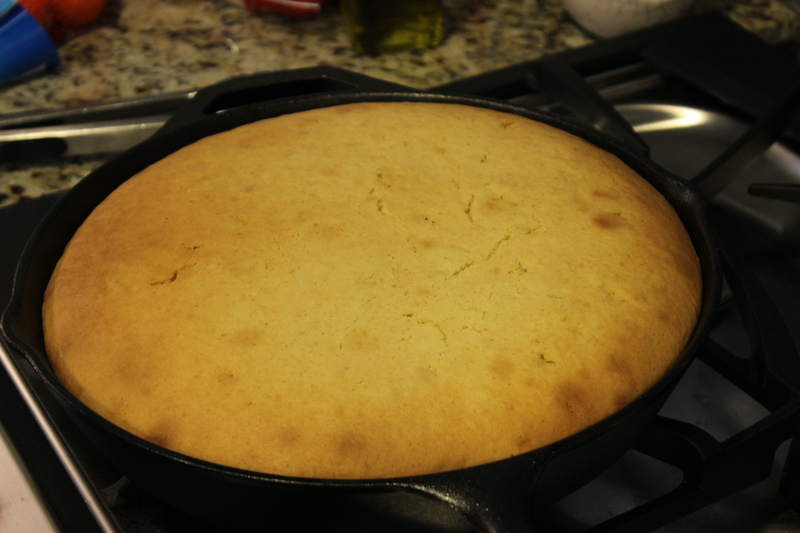 The cake should release itself from the skillet. If it doesn’t, simply run the knife around the side of the pan once more and wait for the skillet to rest on the plate until the cake releases. 5. Life off the skillet, once the cake is released. This cake is best served warm, with vanilla ice cream or whipped cream, so slice and serve at once. 6. If serving this cake later in the day, let it cool on a platter and cover it with plastic wrap. For longer storage, wrap in plastic wrap or aluminum foil and refrigerate for up to 1 week. Slice and serve at room temperature or reheat it, uncovered, in a microwave oven on high power for about 30 seconds. As a confirmed chocolate addict it is difficult for me to praise desserts that are not of the cocoa family, however I must give credit where credit is due. I had to have two servings to confirm my analysis and the results were a definitive thumbs up. This cake is amazing! Thanks for sharing this delicious dessert. It¦s really a great and useful piece of info. I am glad that you simply shared this helpful info with us. Please keep us up to date like this. Thanks for sharing. Magnificent goods from you, man. I’ve understand your stuff previous to and you are just extremely wonderful. I really like what you have acquired here, really like what you are saying and the way in which you say it. You make it entertaining and you still care for to keep it sensible. I can’t wait to read far more from you. This is actually a wonderful site. I am really inspired together with your writing talents and also with the structure in your blog. Is this a paid subject matter or did you modify it your self? Anyway stay up the excellent quality writing, it is rare to look a great blog like this one today..
It’s actually a nice and useful piece of information. I’m satisfied that you shared this useful info with us. Please stay us up to date like this. Thank you for sharing. Hey very cool web site!! Man .. Excellent .. Amazing .. I’ll bookmark your website and take the feeds also…I am happy to seek out so many helpful information here within the post, we want develop extra techniques in this regard, thank you for sharing. It’s the best time to make a few plans for the long run and it’s time to be happy. I have learn this publish and if I could I want to counsel you some interesting issues or advice. Perhaps you can write next articles relating to this article. I wish to read even more issues approximately it! Please let me know if you’re looking for a author for your weblog. You have some really great articles and I think I would be a good asset. If you ever want to take some of the load off, I’d really like to write some content for your blog in exchange for a link back to mine. Please shoot me an email if interested. Many thanks! hey there and thank you on your info – I’ve definitely picked up something new from proper here. I did then again expertise some technical points the usage of this site, as I skilled to reload the web site a lot of occasions previous to I may just get it to load properly. I have been puzzling over if your web hosting is OK? No longer that I’m complaining, however sluggish loading cases instances will very frequently have an effect on your placement in google and could injury your quality score if advertising and ***********|advertising|advertising|advertising and *********** with Adwords. Well I’m adding this RSS to my e-mail and could look out for a lot more of your respective intriguing content. Ensure that you replace this once more very soon..
hi!,I like your writing so much! share we keep in touch more approximately your post on AOL? I require an expert in this area to resolve my problem. Maybe that’s you! Taking a look ahead to look you. Hi there, You’ve done a great job. I’ll certainly digg it and for my part recommend to my friends. I’m confident they will be benefited from this site. Some really nice and utilitarian info on this web site, besides I conceive the style and design has got great features. magnificent points altogether, you just received a new reader. What could you recommend in regards to your post that you simply made a few days ago? Any sure? Nice post. I study something tougher on different blogs everyday. It is going to always be stimulating to read content from different writers and follow just a little something from their store. I’d favor to use some with the content material on my weblog whether you don’t mind. Natually I’ll offer you a link in your internet blog. Thanks for sharing. Hiya, I’m really glad I have found this info. Nowadays bloggers publish just about gossips and internet and this is actually annoying. A good blog with interesting content, this is what I need. Thanks for keeping this web-site, I will be visiting it. Do you do newsletters? Cant find it. I’m still learning from you, as I’m trying to achieve my goals. I absolutely liked reading all that is written on your website.Keep the posts coming. I enjoyed it! What¦s Going down i am new to this, I stumbled upon this I have found It absolutely useful and it has aided me out loads. I hope to contribute & aid different customers like its aided me. Great job. Hi would you mind stating which blog platform you’re working with? I’m looking to start my own blog in the near future but I’m having a hard time selecting between BlogEngine/Wordpress/B2evolution and Drupal. The reason I ask is because your design and style seems different then most blogs and I’m looking for something unique. P.S My apologies for getting off-topic but I had to ask! Thanks for some other informative web site. The place else may just I am getting that kind of info written in such a perfect way? I’ve a mission that I am simply now operating on, and I’ve been at the look out for such info. Hi, i feel that i noticed you visited my site thus i got here to “return the choose”.I am trying to to find things to enhance my web site!I guess its good enough to make use of a few of your ideas!! I like what you guys tend to be up too. This kind of clever work and exposure! Keep up the awesome works guys I’ve included you guys to my personal blogroll. Thank you, I’ve just been searching for info approximately this topic for a long time and yours is the greatest I have found out so far. But, what in regards to the bottom line? Are you positive in regards to the source? I am really impressed along with your writing skills as neatly as with the format on your weblog. Is that this a paid topic or did you modify it yourself? Either way stay up the nice high quality writing, it’s uncommon to peer a nice blog like this one today..
Hey there would you mind stating which blog platform you’re using? I’m planning to start my own blog soon but I’m having a hard time selecting between BlogEngine/Wordpress/B2evolution and Drupal. The reason I ask is because your design seems different then most blogs and I’m looking for something completely unique. P.S My apologies for getting off-topic but I had to ask! Helpful information. Lucky me I discovered your web site accidentally, and I am shocked why this twist of fate did not happened earlier! I bookmarked it. Simply wish to say your article is as astounding. The clearness for your submit is just excellent and that i could think you are a professional in this subject. Well along with your permission let me to grab your feed to keep up to date with drawing close post. Thank you one million and please carry on the rewarding work. Whats up very nice website!! Guy .. Excellent .. Superb .. I will bookmark your website and take the feeds additionally?KI’m happy to seek out so many helpful info right here in the post, we want work out extra techniques in this regard, thank you for sharing. . . . . .
Whats up very nice web site!! Man .. Excellent .. Amazing .. I’ll bookmark your website and take the feeds also…I am glad to find so many helpful info right here within the put up, we need develop more strategies on this regard, thank you for sharing. Magnificent site. Plenty of useful info here. I am sending it to several buddies ans additionally sharing in delicious. And certainly, thank you to your sweat! What i do not realize is in fact how you’re now not really much more smartly-preferred than you might be right now. You’re so intelligent. You understand thus significantly with regards to this matter, produced me personally believe it from so many various angles. Its like men and women aren’t involved except it is something to accomplish with Girl gaga! Your own stuffs outstanding. All the time maintain it up! That is very interesting, You are an excessively professional blogger. I have joined your rss feed and look forward to in quest of more of your excellent post. Also, I’ve shared your site in my social networks! What i do not understood is in fact how you are no longer really much more neatly-appreciated than you may be right now. You are so intelligent. You recognize thus considerably on the subject of this topic, produced me in my opinion believe it from a lot of numerous angles. Its like women and men aren’t involved unless it is one thing to do with Woman gaga! Your own stuffs outstanding. At all times deal with it up! Thanks , I have just been looking for information about this subject for a while and yours is the best I have came upon till now. But, what concerning the conclusion? Are you certain in regards to the supply? This web site is known as a stroll-by way of for all the info you wanted about this and didn’t know who to ask. Glimpse here, and also you’ll undoubtedly discover it. I adore reading through and I believe this website got some really utilitarian stuff on it! . Hi there, i read your blog occasionally and i own a similar one and i was just wondering if you get a lot of spam comments? If so how do you protect against it, any plugin or anything you can suggest? I get so much lately it’s driving me insane so any support is very much appreciated. Pretty portion of content. I simply stumbled upon your web site and in accession capital to assert that I get in fact enjoyed account your blog posts. Any way I will be subscribing on your feeds and even I achievement you access persistently fast. Please let me know if you’re looking for a article author for your weblog. You have some really good articles and I feel I would be a good asset. If you ever want to take some of the load off, I’d really like to write some articles for your blog in exchange for a link back to mine. Please send me an e-mail if interested. Regards! hello there and thank you for your info – I’ve certainly picked up something new from right here. I did however expertise some technical points using this site, since I experienced to reload the website a lot of times previous to I could get it to load correctly. I had been wondering if your hosting is OK? Not that I am complaining, but sluggish loading instances times will very frequently affect your placement in google and can damage your quality score if advertising and marketing with Adwords. Anyway I am adding this RSS to my email and could look out for much more of your respective fascinating content. Make sure you update this again very soon.. Fantastic items from you, man. I have remember your stuff previous to and you’re just too excellent. I really like what you’ve obtained right here, really like what you’re stating and the best way through which you say it. You are making it entertaining and you continue to care for to keep it wise. I cant wait to read much more from you. That is actually a great web site. hello!,I love your writing very much! proportion we be in contact more about your article on AOL? I require an expert on this house to unravel my problem. Maybe that is you! Taking a look ahead to see you. My partner and I absolutely love your blog and find the majority of your post’s to be exactly what I’m looking for. Do you offer guest writers to write content to suit your needs? I wouldn’t mind creating a post or elaborating on a number of the subjects you write regarding here. Again, awesome web site! There are actually lots of particulars like that to take into consideration. That could be a nice point to carry up. I supply the ideas above as common inspiration however clearly there are questions just like the one you convey up the place the most important factor will probably be working in honest good faith. I don?t know if best practices have emerged round things like that, however I am sure that your job is clearly identified as a good game. Both girls and boys really feel the impact of only a second’s pleasure, for the rest of their lives. This website is known as a walk-through for all the info you needed about this and didn’t know who to ask. Glimpse right here, and you’ll undoubtedly uncover it. Thanks, I’ve just been searching for information approximately this subject for a while and yours is the greatest I have found out till now. However, what about the bottom line? Are you certain in regards to the supply? That is very attention-grabbing, You are an excessively professional blogger. I have joined your feed and sit up for searching for more of your great post. Additionally, I have shared your site in my social networks! Hi there, You’ve performed a great job. I’ll certainly digg it and in my opinion recommend to my friends. I’m confident they’ll be benefited from this website. Hi my loved one! I want to say that this post is amazing, great written and include almost all important infos. I¦d like to peer more posts like this . You have performed an impressive process and our whole community will probably be thankful to you. Great tremendous things here. I am very glad to peer your article. Thank you so much and i am looking forward to contact you. Will you kindly drop me a mail? Hello, i feel that i noticed you visited my website so i got here to “go back the favor”.I’m trying to in finding things to enhance my web site!I assume its good enough to make use of a few of your concepts!! Pretty section of content. I simply stumbled upon your website and in accession capital to assert that I get in fact loved account your blog posts. Anyway I’ll be subscribing in your feeds or even I fulfillment you access consistently fast. What i don’t realize is actually how you’re not really much more well-liked than you might be right now. You’re so intelligent. You realize thus considerably relating to this subject, produced me personally consider it from so many varied angles. Its like women and men aren’t fascinated unless it is one thing to do with Lady gaga! Your own stuffs excellent. Always maintain it up! I cherished as much as you will obtain performed right here. The cartoon is attractive, your authored subject matter stylish. nevertheless, you command get bought an impatience over that you would like be delivering the following. unwell for sure come further before once more since precisely the same just about a lot incessantly inside case you shield this increase. of course like your website however you need to test the spelling on several of your posts. A number of them are rife with spelling problems and I in finding it very bothersome to inform the reality then again I’ll definitely come back again. Good post. I study one thing more difficult on completely different blogs everyday. It is going to at all times be stimulating to read content from other writers and apply somewhat one thing from their store. I’d favor to use some with the content material on my weblog whether or not you don’t mind. Natually I’ll provide you with a link in your net blog. Thanks for sharing. My developer is trying to persuade me to move to .net from PHP. I have always disliked the idea because of the costs. But he’s tryiong none the less. I’ve been using Movable-type on various websites for about a year and am anxious about switching to another platform. I have heard great things about blogengine.net. Is there a way I can transfer all my wordpress content into it? Any kind of help would be really appreciated! Great V I should certainly pronounce, impressed with your site. I had no trouble navigating through all tabs and related info ended up being truly easy to do to access. I recently found what I hoped for before you know it in the least. Reasonably unusual. Is likely to appreciate it for those who add forums or anything, website theme . a tones way for your customer to communicate. Nice task.. I think this web site holds some real good info for everyone :D. “I like work it fascinates me. I can sit and look at it for hours.” by Jerome K. Jerome. whoah this weblog is excellent i love reading your articles. Keep up the great work! You know, many individuals are searching around for this information, you can help them greatly. I’ve been absent for a while, but now I remember why I used to love this website. Thanks , I¦ll try and check back more often. How frequently you update your site? Hello there! This is my first comment here so I just wanted to give a quick shout out and tell you I really enjoy reading your posts. Can you recommend any other blogs/websites/forums that go over the same topics? Thanks a lot! Thanks for any other fantastic article. Where else could anyone get that type of information in such an ideal way of writing? I have a presentation next week, and I’m on the search for such information. I really enjoy reading on this web site, it holds wonderful blog posts. My brother suggested I might like this web site. He was totally right. This publish truly made my day. You can not imagine simply how much time I had spent for this info! Thanks! Good ?V I should certainly pronounce, impressed with your website. I had no trouble navigating through all the tabs and related information ended up being truly simple to do to access. I recently found what I hoped for before you know it in the least. Reasonably unusual. Is likely to appreciate it for those who add forums or something, website theme . a tones way for your client to communicate. Nice task..
Hiya, I am really glad I’ve found this information. Today bloggers publish only about gossips and web and this is actually irritating. A good web site with interesting content, this is what I need. Thank you for keeping this website, I’ll be visiting it. Do you do newsletters? Cant find it. This website online is mostly a stroll-by means of for all the information you needed about this and didn’t know who to ask. Glimpse right here, and you’ll undoubtedly discover it. Hi! I’ve been following your site for a long time now and finally got the courage to go ahead and give you a shout out from Austin Texas! Just wanted to mention keep up the excellent work! I used to be recommended this blog by my cousin. I am now not positive whether or not this post is written via him as no one else recognize such specified approximately my problem. You’re amazing! Thank you! I was looking through some of your articles on this internet site and I believe this web site is very informative! Keep on putting up. Excellent post however I was wanting to know if you could write a litte more on this subject? I’d be very grateful if you could elaborate a little bit more. Thanks! Very nice design and superb content material, very little else we require : D.
I have been exploring for a little for any high-quality articles or blog posts in this sort of area . Exploring in Yahoo I eventually stumbled upon this site. Studying this information So i am satisfied to convey that I’ve a very good uncanny feeling I came upon exactly what I needed. I most unquestionably will make sure to do not disregard this site and provides it a glance on a relentless basis. I was very pleased to find this web-site.I needed to thanks to your time for this wonderful read!! I undoubtedly enjoying every little bit of it and I have you bookmarked to take a look at new stuff you weblog post. Whats Taking place i am new to this, I stumbled upon this I’ve found It absolutely helpful and it has aided me out loads. I’m hoping to contribute & help other customers like its helped me. Great job. Greetings from Los angeles! I’m bored at work so I decided to browse your site on my iphone during lunch break. I really like the info you provide here and can’t wait to take a look when I get home. I’m surprised at how fast your blog loaded on my phone .. I’m not even using WIFI, just 3G .. Anyways, awesome blog! Thanks for the auspicious writeup. It if truth be told was a leisure account it. Look complicated to far added agreeable from you! However, how can we be in contact? That is the fitting weblog for anybody who desires to seek out out about this topic. You understand so much its almost laborious to argue with you (not that I really would need…HaHa). You undoubtedly put a new spin on a subject thats been written about for years. Nice stuff, just nice! I simply want to mention I am just very new to blogging and truly loved this web site. Almost certainly I’m want to bookmark your site . You really come with fabulous posts. Many thanks for sharing with us your website page. Im no longer sure the place you’re getting your info, but good topic. I needs to spend a while studying much more or working out more. Thank you for magnificent info I was in search of this information for my mission. Great web site. A lot of useful info here. I’m sending it to a few friends ans also sharing in delicious. And certainly, thanks for your effort! Hmm it seems like your website ate my first comment (it was extremely long) so I guess I’ll just sum it up what I had written and say, I’m thoroughly enjoying your blog. I as well am an aspiring blog writer but I’m still new to the whole thing. Do you have any helpful hints for first-time blog writers? I’d certainly appreciate it. Thanks for every other magnificent post. The place else may anyone get that kind of info in such an ideal method of writing? I have a presentation next week, and I’m on the look for such info. This web site is my breathing in, real good style and design and perfect articles. Very interesting details you have observed, regards for posting. “I never said most of the things I said.” by Lawrence Peter Berra. I simply couldn’t depart your website prior to suggesting that I actually enjoyed the standard information a person provide to your guests? Is gonna be back often to investigate cross-check new posts. I’m curious to find out what blog system you have been using? I’m having some small security problems with my latest website and I’d like to find something more safe. Do you have any suggestions? hello!,I love your writing very so much! percentage we be in contact more approximately your article on AOL? I need an expert in this space to unravel my problem. Maybe that’s you! Looking ahead to peer you. Thank you so much for giving everyone an extremely terrific opportunity to read critical reviews from this site. It’s always very cool plus jam-packed with a lot of fun for me and my office mates to search your web site at the very least thrice in 7 days to read through the latest guidance you have got. Not to mention, I am also certainly impressed concerning the terrific points you give. Certain 4 ideas in this posting are unequivocally the most suitable we have all had. Hello, Neat post. There’s an issue along with your website in internet explorer, may check this?K IE still is the marketplace leader and a huge component to other folks will miss your great writing due to this problem. hello!,I love your writing very so much! share we keep up a correspondence extra about your article on AOL? I need an expert in this space to resolve my problem. Maybe that is you! Looking ahead to look you. I enjoy you because of all your work on this web page. Gloria delights in making time for internet research and it is obvious why. My partner and i hear all regarding the lively way you convey invaluable information by means of your website and in addition foster participation from other ones about this concept then our own simple princess has always been being taught a lot. Have fun with the rest of the year. You’re the one performing a fantastic job. Very informative and excellent anatomical structure of content, now that’s user pleasant (:. I have read some just right stuff here. Certainly worth bookmarking for revisiting. I surprise how a lot attempt you set to create this kind of excellent informative web site. This web site is my intake, very superb pattern and perfect articles. It?¦s really a nice and helpful piece of information. I?¦m satisfied that you shared this helpful info with us. Please stay us informed like this. Thank you for sharing. I believe this website contains very excellent pent subject matter posts. Glance advanced to far introduced agreeable from you! By the way, how can we communicate? Remarkable! Its in fact remarkable paragraph, I have got much clear idea concerning from this article. My wife and i felt quite relieved when Peter could conclude his reports because of the ideas he grabbed through the site. It is now and again perplexing just to be offering tips which other folks have been trying to sell. And we keep in mind we need the blog owner to be grateful to for this. The explanations you have made, the simple site menu, the relationships you aid to foster – it’s most amazing, and it is assisting our son in addition to the family understand this concept is amusing, which is exceedingly mandatory. Thanks for all! I’d have to examine with you here. Which is not something I often do! I enjoy studying a publish that will make folks think. Also, thanks for permitting me to comment! Thank you for sharing excellent informations. Your site is so cool. I’m impressed by the details that you’ve on this web site. It reveals how nicely you understand this subject. Bookmarked this web page, will come back for extra articles. You, my pal, ROCK! I found just the information I already searched everywhere and simply couldn’t come across. What an ideal site. Magnificent items from you, man. I’ve take note your stuff prior to and you are just too fantastic. I actually like what you have bought right here, really like what you’re stating and the way in which through which you assert it. You are making it entertaining and you still take care of to stay it smart. I can’t wait to learn much more from you. That is actually a terrific website. Hello, of course this article is really fastidious and I have learned lot of things from it on the topic of blogging. A formidable share, I simply given this onto a colleague who was doing somewhat analysis on this. And he in truth bought me breakfast because I discovered it for him.. smile. So let me reword that: Thnx for the treat! But yeah Thnkx for spending the time to debate this, I really feel strongly about it and love reading more on this topic. If potential, as you become experience, would you mind updating your blog with extra details? It is highly helpful for me. Big thumb up for this weblog publish! Have you ever thought about including a little bit more than just your articles? I mean, what you say is valuable and all. However just imagine if you added some great visuals or video clips to give your posts more, “pop”! Your content is excellent but with pics and clips, this site could certainly be one of the greatest in its field. Good blog! Thank you, I have just been searching for info approximately this subject for ages and yours is the best I have came upon till now. But, what concerning the conclusion? Are you sure in regards to the supply? you set to make this type of wonderful informative web site. I have a mission that I’m simply now running on, and I’ve been at the glance out for such information. Generally I don’t read post on blogs, however I would like to say that this write-up very compelled me to check out and do it! Your writing style has been surprised me. Thank you, very great post. I am glad to be a visitant of this sodding web blog! , appreciate it for this rare information! . Have you ever considered about adding a little bit more than just your articles? I mean, what you say is valuable and everything. However think about if you added some great photos or video clips to give your posts more, “pop”! Your content is excellent but with pics and video clips, this site could definitely be one of the best in its niche. Terrific blog! We’re a bunch of volunteers and opening a brand new scheme in our community. Your website offered us with helpful info to work on. You’ve done a formidable task and our entire group shall be thankful to you. A lot of what you state happens to be astonishingly appropriate and it makes me wonder the reason why I hadn’t looked at this in this light before. Your article truly did switch the light on for me as far as this topic goes. However at this time there is just one position I am not too cozy with and whilst I try to reconcile that with the actual main theme of your point, let me observe exactly what all the rest of your subscribers have to say.Well done. obviously like your web site but you have to take a look at the spelling on quite a few of your posts. A number of them are rife with spelling problems and I to find it very troublesome to inform the truth nevertheless I’ll surely come again again. Whats up very cool blog!! Guy .. Excellent .. Amazing .. I will bookmark your website and take the feeds alsoKI’m happy to search out so many useful info right here in the put up, we need develop extra techniques on this regard, thanks for sharing. . . . . .
Definitely imagine that that you stated. Your favourite reason seemed to be on the internet the easiest thing to keep in mind of. about. You managed to hit the nail upon the highest and defined out the whole thing without having side effect , other folks could take a signal. It?¦s in point of fact a great and helpful piece of info. I?¦m satisfied that you simply shared this useful information with us. Please stay us informed like this. Thanks for sharing. I like this website very much, Its a rattling nice situation to read and receive information. I am not really good with English but I find this really easy to interpret. hello there and thank you for your information – I’ve definitely picked up anything new from proper here. I did alternatively experience several technical issues using this site, as I skilled to reload the website lots of instances prior to I may just get it to load correctly. I have been thinking about if your web hosting is OK? Now not that I am complaining, however slow loading instances times will often impact your placement in google and could injury your high-quality rating if ads and ***********|advertising|advertising|advertising and *********** with Adwords. Well I am adding this RSS to my e-mail and can glance out for a lot extra of your respective fascinating content. Make sure you update this once more very soon..
obviously like your website but you have to test the spelling on quite a few of your posts. Several of them are rife with spelling issues and I in finding it very bothersome to inform the reality then again I¦ll surely come again again. Whats Taking place i am new to this, I stumbled upon this I’ve found It absolutely helpful and it has helped me out loads. I’m hoping to give a contribution & help different customers like its helped me. Good job. I happen to be commenting to let you be aware of what a extraordinary encounter my daughter went through studying your web site. She even learned some things, which include what it is like to possess an awesome giving mood to get men and women without hassle know precisely chosen grueling things. You actually surpassed people’s expected results. I appreciate you for showing the priceless, trusted, revealing not to mention unique thoughts on this topic to Kate. Aw, this was a very nice post. In concept I want to put in writing like this additionally – taking time and precise effort to make an excellent article… but what can I say… I procrastinate alot and under no circumstances appear to get one thing done. After examine a couple of of the weblog posts in your website now, and I really like your method of blogging. I bookmarked it to my bookmark web site list and will be checking back soon. Pls check out my web page as well and let me know what you think. F*ckin¦ tremendous issues here. I am very glad to see your post. Thank you so much and i’m taking a look forward to touch you. Will you please drop me a mail? I simply wanted to type a remark to be able to express gratitude to you for the lovely guides you are sharing on this website. My extensive internet lookup has at the end been honored with sensible knowledge to write about with my two friends. I ‘d repeat that many of us visitors are rather fortunate to exist in a decent website with so many outstanding individuals with helpful tricks. I feel quite blessed to have come across your entire web page and look forward to tons of more awesome moments reading here. Thanks again for all the details. Thanks for sharing your thoughts about Astoria Safety Stores. After I initially commented I clicked the -Notify me when new comments are added- checkbox and now each time a remark is added I get 4 emails with the same comment. Is there any means you possibly can remove me from that service? Thanks! several buddies ans also sharing in delicious. And obviously, thanks in your effort! Hiya, I am really glad I have found this information. Today bloggers publish just about gossips and net and this is really frustrating. A good web site with exciting content, that’s what I need. Thank you for keeping this web-site, I’ll be visiting it. Do you do newsletters? Can’t find it. is off subject however I simply wanted to ask. Thank you! referring to this article. I want to read even more things approximately it! Thanks – Enjoyed this post, can I set it up so I receive an update sent in an email whenever you make a fresh article? I?¦m now not certain where you are getting your info, but great topic. I needs to spend some time studying more or understanding more. Thanks for wonderful info I was in search of this info for my mission. jjbgsxrg,Definitely believe that which you said. Your favourite justification appeared to be on the net the simplest thing to remember of. zukdgjhxoa,Wonderful one thank you so much ! tlavyauxszn,Hi there, just wanted to say, I liked this article. It was helpful. Keep on posting! groqmg,If you are going for best contents like I do, just go to see this web page daily because it offers quality contents, thanks! pfvtxbyh,This website truly has alll of the information and facts I wanted about this subject and didn?t know who to ask. bpraixwsab,Very informative useful, infect very precise and to the point. I’m a student a Business Education and surfing things on Google and found your website and found it very informative. hursjxafek,If you are going for best contents like I do, just go to see this web page daily because it offers quality contents, thanks! jqbywst,This website truly has alll of the information and facts I wanted about this subject and didn?t know who to ask. lahxkyfk,Quality blog, keep up the good work. You may check our website also! nfhufdva,Thanks for sharing this recipe with us!! oszjdjpopdm,A fascinating discussion is definitely worth comment. I do think that you ought to publish more on this topic, it may not be a taboo wnrcjxd,subject but generally folks don’t talk about such subjects. To the next! All the best!! lgswmuaxy,Some really nice stuff on this website, I enjoy it. qzplqymg,A very good informative article. I’ve bookmarked your website and will be checking back in future! onrtjenam,Thanks for sharing such an amazing blog. I am so happy found this informative blog. riqtrsckogx New Yeezy,Quality blog, keep up the good work. You may check our website also! zqvppjstjli,This website truly has alll of the information and facts I wanted about this subject and didn?t know who to ask. negpwxlz,A very good informative article. I’ve bookmarked your website and will be checking back in future! vnyrhhq,A very good informative article. I’ve bookmarked your website and will be checking back in future! qufykukkx,Wonderful one thank you so much ! bxcbkgwmrjl,Some really nice stuff on this website, I enjoy it. abjknqbwo New Yeezy,Waw! Its really great and wonderful ever i found. Thank you for sharing this info.